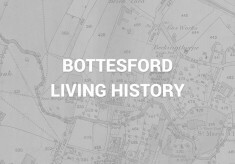 This group of items records Scheduled Ancient Monuments, Sites of Archaeological Interest and Listed Buildings in Bottesford and Muston. The information comes from Records of the Jewry Wall Museum, Leicester, and from the websites of Historic England and British Listed Buildings. Reference is also made to The Medieval Earthworks of North-East Leicestershire, by Robert F. Hartley, published in 1987 as part of the Archaeological Report Series of the Leicestershire Museums, Art Galleries and Records Service. Local information is also used as appropriate. The British Listed Buildings (.co.uk) records of Listed Buildings in Bottesford, Melton, Leicestershire. Site of archaeological interest – a record of an iron-age rectangular enclosure at “The Debdale SW”, location SK 833 386.